Suddenly, glass domes are everywhere in Seattle. One is a corporate giant’s office space, and the other is an art museum, but they both provide equally engaging experiences and speak for and celebrate our region’s innovative nature and creative energy. The Amazon Spheres, the signature showpiece of Amazon’s $4 billion downtown Seattle headquarters, officially opened on January 29, 2018, and to considerable excitement. These distinctive glass-and-steel spheres have been one of the most photographed spots in the city since the completion of the exterior in 2016. Sometimes called “The Domes,” they resemble three conjoined bubbles, the biggest of which is 90 feet tall and 130 feet wide. Home to some 40,000 plants that span more than 400 species from around the world, the Spheres are a result of an innovative way of rethinking the workplace by linking urban offices to nature. The interior features waterfalls, a river, and a four-story 4,000 square feet living wall. It’s a giant open space that has no enclosed offices and conference rooms. 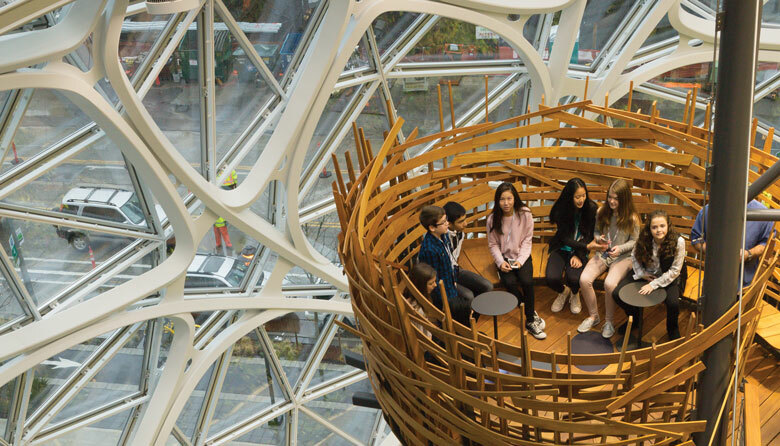 Amazonians can meet and collaborate in "treehouse" and "nest" meeting rooms (suspended under 40+ foot trees) or in walking paths and sitting paths alongside the waterfalls. For now, only Amazon employees at the Seattle office can access the main space of the Spheres. But the company has provided a couple of options for the public to tour the space. “The Understory” is a visitor center at the base of the Spheres that provides a 360-degree immersive and interactive exhibit of the building and the plants. But this is only a self-guided, museum style exhibit. To see and experience the indoor gardens, you’ll need to join the company’s guided HQ tours. Admissions are free, but reservations are required. Located next to Space Needle in Seattle Center, Chihuly Garden and Glass has become a local favorite and a not-to-miss spot for visitors since its opening in 2012. 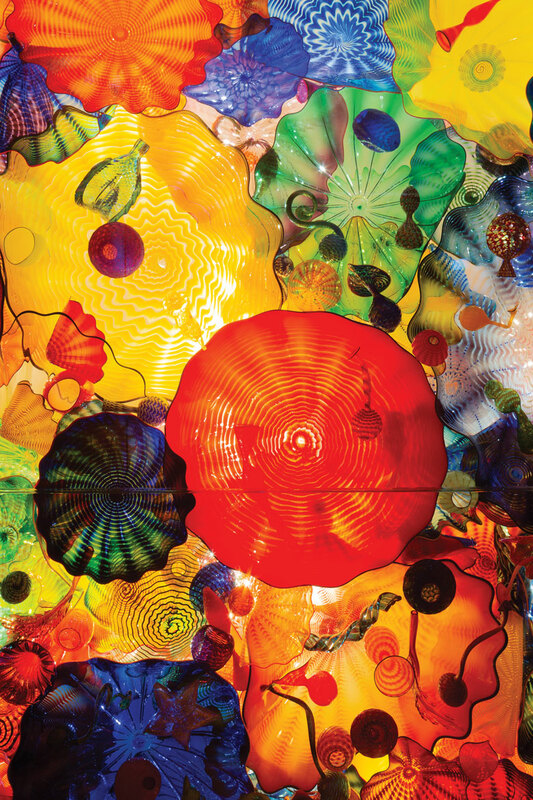 It houses world-renowned Seattle glass artist Dale Chihuly’s most comprehensive work. Here the exhibition comes alive through molten color. You are guaranteed to wow your way through the indoor galleries, the Glasshouse, and the Garden. The eight indoor exhibition galleries showcase the artist’s signature works. Inspired by Chihuly’s two favorite buildings, Paris’ Sainte-Chapelle and London’s Crystal Palace, the center piece Glasshouse is a naturally lit glass-and-steel structure featuring a 100-foot red, orange, and yellow flower sculpture that sprawls across the ceiling. As you walk with head tilted back to admire this statement piece, you will also see the Space Needle looming above. In the outdoor Garden, glass art is intermingled with flowers and other plants. When you come to visit this glass wonderland, make sure to clear some space on your phone or camera for photos of every art piece, and of course selfies. Understory: Monday – Saturday 10:00 am – 8:00 pm; Sunday 11:00 a.m. - 7:00 p.m.